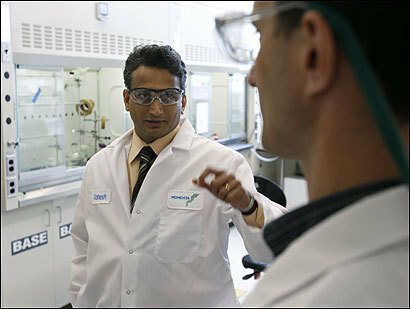 When he came to the Massachusetts Institute of Technology in the 1980s to study chemical engineering, Ganesh Venkataraman , a 21-year-old graduate of the Indian Institute of Technology in Madras, thought he'd eventually return to India and work in academia. Twenty years later, Venkataraman is still here, and his career has taken a far different path than he imagined. He was a scientific co founder of Momenta Pharmaceuticals Inc., a venture-backed start-up developing drugs based on sugar-sequencing technology, and works as its senior vice president of research. The company, based in Cambridge, had a successful initial public offering in 2004. Venkataraman's journey from India to America, and his transformation from engineer to scientist-entrepreneur, is emblematic of a generation of Indian-born immigrants who arrived in the United States for graduate school and stayed to become a key part of high-tech start - ups in fields like life sciences and telecommunications. Many of these immigrants, and their companies, have become the gold standard for venture capital investment. In the past two months alone, four Massachusetts companies with Indian chief executives have registered with the Securities and Exchange Commission to go public: Starent Networks Corp. of Tewksbury, Netezza Corp. of Framingham, BladeLogic Inc. of Lexington, and Virtusa Corp. of Westborough. They represent a third of state companies that have filed for IPOs this year. While their businesses range from software to networking, these entrepreneurs have embraced the ambitious US start - up culture, where labs spin off technologies into businesses funded by risk-oriented investors. "Rather than work on fancy long-term research, I realized I wanted to do something where I could have impact in the short term," recalled Venkataraman. "So that pushed me into entrepreneurship." The chiefs of the companies going public declined to comment for this story, citing a "quiet period" imposed by regulators in advance of their IPOs. Today, with venture outlays at a post-2001 high and the number of filings for initial public offerings increasing, the Indian entrepreneurs find themselves in demand. "It's a very productive community," said Rod Randall , senior managing director at Vesbridge Partners in Westborough, one of many Boston-area venture firms that look to Indian immigrants as weather vanes of technology trends. Indeed, the technical training provided in India and the start - up culture in the United States have proved a potent mix. "If you have dreams of building things and achieving things in your life, the US has always been the place to do it," said Raj Alur , an investor and entrepreneur who is president of the Boston chapter of The Indus Entrepreneurs, a non profit organization better known as TiE. Many at TiE cite as their models Gururaj "Desh" Deshpande , the serial entrepreneur who founded Cascade Communications Corp. in Westford and Sycamore Networks Inc. in Chelmsford and endowed the Deshpande Center for Technological Innovation at MIT, and Vinod Khosla , a Silicon Valley venture capitalist who was co founder of Sun Microsystems Inc. in Santa Clara, Calif. But they are just two of the best known of the scores of Indian immigrants who've started, grown, sold, and taken public hundreds of US companies. One measure of the influence of the Indian technology community is the more than 1,200 people expected to attend next month's TiECON convention in the Hynes Convention Center in Boston. The annual convention, once held at a small hotel off Route 128, this year has attracted speakers ranging from Governor Deval Patrick to Lycos Inc. founder Bob Davis to Google Inc. board member Ram Shriram . For venture capitalists, gatherings sponsored by TiE have become can't-miss events on both US coasts. "VCs go where the entrepreneurs are," said Al Kapoor , president of Millennium Ventures Group in Boston and chairman of TiECON . At a TiE convention in California's Silicon Valley last year, legendary investor John Doerr , partner at the venture firm Kleiner Perkins Caufield & Byers, which has backed start - ups like Google and Amazon.com, suggested that 50 percent of the gains at Kleiner's portfolio companies were generated by members of his audience. "What the Indians have done is developed a strong community around entrepreneurship," said Sean Dalton , managing general partner at Highland Capital Partners in Lexington, who will speak at TiECON , June 14 to 16, at the Hynes. "Fundamentally, our business is about finding great people with big ideas. So for firms focused on early stage start - ups, like Highland, this is must-go." Neeraj Agrawal , partner at Battery Ventures in Waltham, estimated that roughly a quarter of the start - ups funded by Battery have chief executives of Indian origin, while half have Indians in their senior management ranks. "You want to fish in a good pond," Agrawal said. "These are guys who will run through walls to make things happen." Many of the Indian immigrants who gravitate to entrepreneurship in the United States are engineers who did their undergraduate work at the Indian Institutes of Technology, or IITs, a network of schools known for drilling down deeply into technical subject matter and for being among the most competitive in the world. Agrawal said the focus on technology in India "goes down to the very core of how computers work, how the bits and bytes flow. When you have that foundation and you come across real problems, you can think about them in a multi dimensional way," he said. "IITs take 2 percent of their applicants, so the competition is savage and intense," said Amar Sawhney , a graduate of the IIT in Delhi who founded his fourth company, Waltham medical device maker I-Therapeutix Inc., in January after selling his previous company. "You've got to have the smarts and you've got to have the hunger." Graduates of the IITs who come to the United States to attend graduate programs are among the most competitive slice of the most competitive cohort in India. Thus, they are ripe for entrepreneurial risk. "When I came to this country, I had $500 in my pocket," Sawhney recalled. "What did I have to lose? I wonder if my kids and the kids of my friends who have been successful will have that same drive."